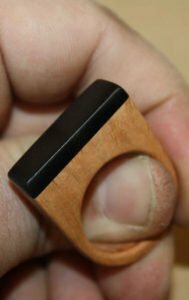 This Ebony and Briar wooden ring is an example of how you can create a design that is not as common looking, and still have a great looking piece. Most rings are round, so doing something different can make a ring stand out. In this case, a flat top style draws attention to the ring, and it’s not so over the top that people wouldn’t wear it. I made the ring from Ebony and Briar. The Briar is the lighter wood, and the Ebony is on the top accent. To make the Ebony and Briar wooden ring, I glued a smaller piece of Ebony to the top of a larger piece of Briar. Once dry, I drilled the finger opening and then cut the ring to shape. After initial shaping, I sanded the ring to remove all scratches and round the corners. Then, I switched to finer and finer grits until I sanded the piece very smooth. After that, it was on to the buffing wheel. , which allows me to put a nice shine on bare wood. It’s a three buff system, with two buffs for compound and one for wax. Most of the time, the pieces of wood already look great right off the first wheel. The real beauty of this system is that you can finish a piece in just a couple minutes. It sometimes takes longer to switch the buffs than it takes to polish the wood. This made finishing the Ebony and Briar wooden ring very easy. When you are making your next ring, try something new. If you have made tons of round rings, it may be time to try another shape. Flat top rings are still a traditional look, and they date back a very long time. If you want something that is a little different but still has traditional roots, a flat top may be perfect. Also, if you are designing something different, consider what your customers will wear. If you design a ring that only a Paris fashion model would wear, then you had better hope to sell it to a Paris fashion model. For most people, coloring a little outside the lines is good…but not too far. explains how to make beautiful wooden rings without many tools. There are step by step instructions, and examples of over fifty wooden rings. Anyone can make a nice wooden ring, and the book makes it easy. If you have any questions on my Ebony and Briar Wooden Ring, please leave a comment and I will be glad to answer you. Also, please Subscribe so you don’t miss out on anything. Happy building.